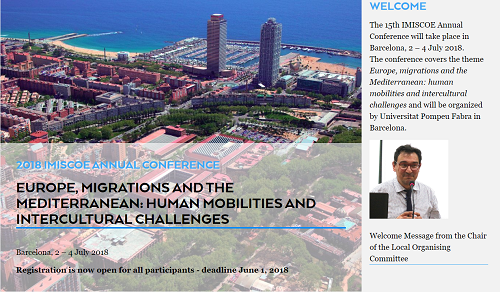 The launch of the registration-website will provide you with registration-options, but also with the conference program and all practical information on conference venue and hotel accommodations. Register before June 1, 2018 to benefit from the "Early Bird" Registration rate of 200 euros. 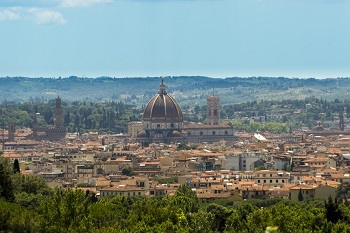 Registration rate after June 1 will be 250 euros . We do not accept wire or bank transfers. The portal will close June 25, 2018 (24:00 CEST time). 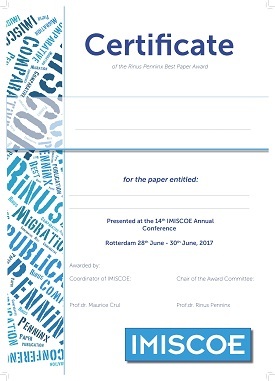 The Rinus Penninx best paper award in honour of the founding father of IMISCOE is an annual award for the best paper submitted to and presented at the IMISCOE annual conference. The award is sponsored by the journal Comparative Migration Studies. An anonymous review committee decides on the allocation of the award. Besides the honour of receiving the award, the prize winner also receives € 750.-- and the opportunity to publish the paper in the journal CMS. To be eligible for the Rinus Penninx Best Paper Award, please submit your paper before 21 May 2018 by uploading your paper via the website or send your paper to the chair of your panel. Chairs can nominate full papers and are not restricted to the number of nominations. Only original, non-published papers are taken into consideration for the prize. When a paper has more than one author, an authorship note should be added in which the role of each author is explained. In case information on conveners and/or chair is not available in the programming of the conference sessions, the submission will have to be sent to IMISCOE’s network office (info@imiscoe.org). ReSOMA - Research Social Platform on Migration and Asylum - is a project funded under the Horizon 2020 Programme that aims at creating a platform for regular collaboration and exchange between Europe’s well-developed networks of migration researchers, stakeholders and practitioners to foster evidence-based policymaking. Being a Coordination and Support Action (CSA), ReSOMA is meant to communicate directly with policy makers by providing ready-to-use evidence on policy, policy perceptions and policy options on migration, asylum and integration gathered among researchers, stakeholders and practitioners. Join the newly-established Expert Database to share your expertise, broaden your professional network and be consulted directly through ad-hoc surveys and thematic discussions .